MacroAir has released their new Product Selection Guide (PSG). If you have older versions of MacroAir’s PSG, please discard all copies (physical and digital). The original 3-blade fan is now called an AVD3-430. 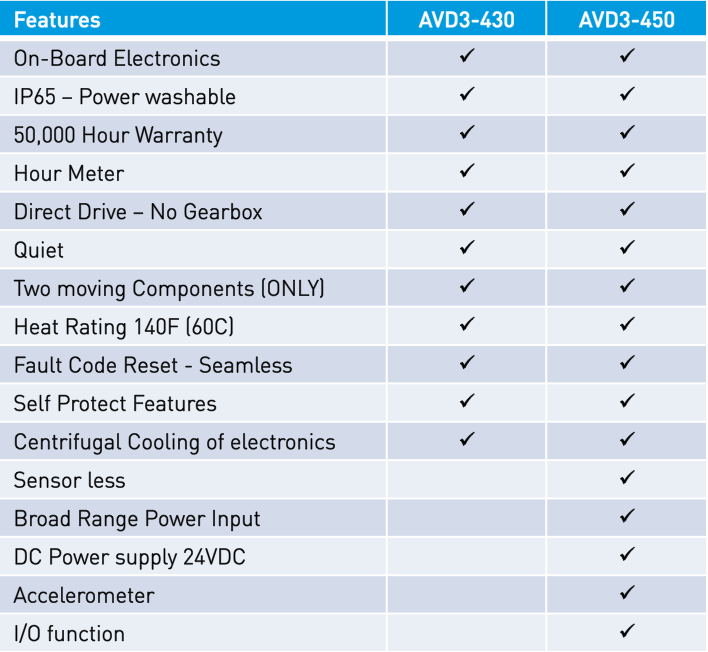 The new AVD3-450 is a 3-blade fan with a larger voltage range, additional control features, and rapid mount industrial compatibility. It can also be powered through the AirBrain processor and does not need to be tied to a lighting circuit for power. This new ordering process also enables you to purchase blades and fan units separately, making stocking simple. Don’t forget about the additional options like powdercoating and the light kit. With our Universal Mount re-design, MacroAir now has the ability to stock drop length tubes. When ordering “stock drop length” from Step 5 on fan page you save on lead time. However, If you need a custom drop length, order the length longer than needed, and MacroAir will cut it down to the desired length for a $250 customization fee. As a reminder, to determine desired drop length measure the distance from mounting point to the blades. Now you have the ability to control more than one fan, on a smaller scale network. The new Controller 4 allows you to control up to 4 fans at once. It can also be purchased with a temperature sensor. The new Controllers can operate and schedule up to 10, 20 or 30 fans depending upon the model that is ordered. They also interface with AirEffect for automated climate control based upon temperature and humidity levels. AirEffect is an optional control system that sense and automatically maintains the desired room temperature. It measures temperature and humidity level at two points: floor and ceiling. It also works with all networked AirVolution-D fans.